When you think of your drive-thru, you think of speed. After all, so do your customers. People generally use drive-thrus when they don’t have time to sit down in a restaurant. You can’t skimp on quality — nothing chases away customers faster than poor food or wrong orders — yet they still want it fast, so speed of service has long been considered the key measure of drive-thru success. But, what if we told you that the number of cars in line and average ticket played a bigger role than you thought? Let’s take a quick detour to talk about baseball. Remember the 2011 movie (and book) “Moneyball?” It was about how the 2002 Oakland Athletics shifted their focus from traditional baseball stats like batting average and runs batted in, to other often overlooked stats like how frequently a batter gets on base. By simply shifting the stats they prioritized, the A’s made the playoffs in 2002 and 2003, despite having a budget only a fraction the size of more prominent teams. Drive-thru speed of service is the batting average of the QSR industry. It’s an important metric, to be sure — but the number of cars in line and the average ticket may be better indicators of your customers’ drive-thru experience. Here are a few examples to explain. It’s lunch rush on a busy day. You have customers lined up past your drive-thru line and into the parking lot. Your employees are buzzing around like excited worker bees, but they can barely keep up with the customers. This is when the car count really matters. After all, too many cars in line could scare away potential business. Some QSRs have even gone to two-lane drive-thrus to limit these situations, but there are still times when the line gets too long. Counting the number of cars served at the drive-thru window helps you identify base metrics for normal traffic and address the extra volume before it becomes noticeable to customers. For example, when the number of cars going through the drive-thru is higher than normal for that daypart, the manager can move proactively to speed things along and keep your customers happy. If the lobby is slower and the drive-thru is really busy, the manager can shift more employees to helping the drive-thru, even if it’s simply filling and re-filling products. Sure, this is still a way to ensure speed of service, but counting cars helps predict and solve problems before they even happen. It’s a quiet Thursday afternoon, too late for lunch but too early for dinner. There’s only one car in line at the drive-thru, and they’ve been studying the menu for five minutes. How do you handle this? If there are no cars in line, the obvious choice should be “2.” Speed of service is crucial when your customers are anxious to get through the drive-thru line, but when you have the opportunity to focus on promotions or average ticket, take advantage of it. Is this the only time to upsell? Of course not. We don’t want a guest to pull away without a beverage because they forgot to order one and we didn’t ask, but some situations lend themselves to more customer service, and the payoff in increased ticket size may outweigh the slight impact in speed of service. How do these metrics add up to better service? It may sound simple, but it can be challenging to put these principles into practice, especially if you’re managing multiple stores or if your system isn’t able to track metrics like cars in line in real-time. Stores that are incentivized to keep speed of service times down based on daily averages may be tempted to rush customers through the drive-thru at all times, even when that’s not best for the guests or the restaurant. And, if speed of service is the only metric they’ve been told to focus on, can you blame them for trying too hard to keep it low? 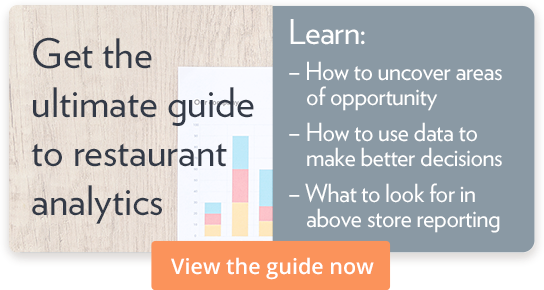 Remember that distinguishing your QSR as a great place to eat regardless of time of day is huge for guests. They want a great personalized experience every time. Hitting all the extras, all the specials, and providing great hospitality each time they visit leaves a lasting impression. The last thing they want is to feel hurried because the store is “busy,” so use all of these metrics to guide your decision-making and keep your team dialed into the service steps — including speed. As the baseball execs discovered in “Moneyball,” keeping an eye on additional metrics is a great way to ensure overall success.